By inventing level-independent dynamic processing in the 1990's, SPL provided the foundation for all transient processing tools. They have once again resorted to this proven and tested technology to develop their latest software tool: the DrumXchanger, a plug-in that can replace drum sounds in multitrack sessions irrespective of their level. According to SPL, it works in real time and replaces samples phase-accurately in the original signal. Besides the basic functions to process the original and sample signals, DrumXchanger includes two fully operational Transient Designer processors, as well as high-pass and low-pass filters for the original, sampled, and output signals. All samples can be pitch-shifted one octave above or below in real time, while a delay control allows precise sample replacement. SPL included a basic library with high-quality 24-bit/96kHz samples. The library, created exclusively with SPL's preamps and processors, includes three drum kits with one snare, one bass drum and four toms each. Every multisample is made up of up to 80 sounds in sixteen dynamic levels and five variations. Furthermore, users have the possibility to load their own WAV samples; the creation and import of multisamples, as well as the implementation of MIDI (In/Out) capabilities, are in the planning. DrumXchanger will be available for a suggested retail price of $449 (€299), excl. VAT. 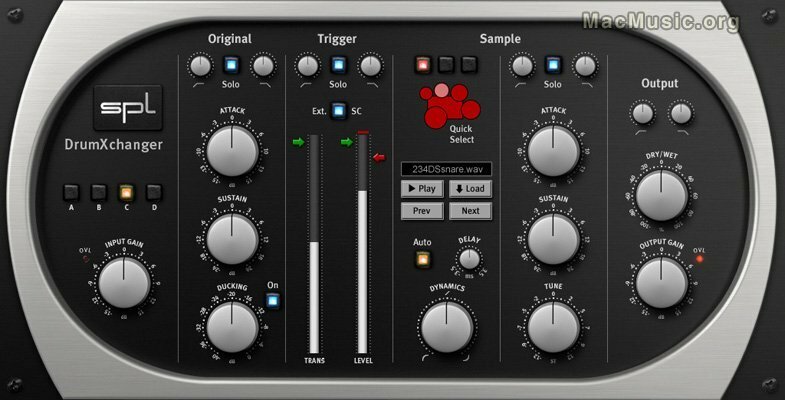 The native version includes RTAS, VST, and AU support for Mac and PC. As part of the product launch campaign, SPL is planning to offer some special deals, which include discounts to owners of the Transient Designer plug-in.